When “Persepolis” screened in competition in Cannes this past May, Iran raised a ruckus, protesting to the French government about the film’s negative take on Islam. But it will take more than Iran’s ire to stop this baby, an adaptation of Marjane Satrapi‘s acclaimed graphic novels. Not only did France wave off the protests from Teheran, “Persepolis” — co-directed by Satrapi and Vincent Paronnaud — has continued to reap honors, including the Cannes Jury Prize, Oscar contender for Best Foreign Picture (France), winner for Best Animated Feature from the New York Film Critics Circle and the Los Angeles Film Critics Association, a Golden Globe nominee for Best Foreign Film, and the list goes on and on. Now “Persepolis” has been dubbed in English, with Chiara Mastroianni and Catherine Deneuve reprising their roles as Marjane and her mother; Sean Penn voicing Marjane’s dad, Gena Rowlands her grandmother, and Iggy Pop her Uncle Anouche. In “Persepolis,” opening here December 25th, the folks at Sony Classics have come up with a winning maverick: a crowd pleaser that also traffics in politics — often box office poision — while bumping up the artistic level of animation as a genre. Set in Teheran in 1978, “Persepolis” is a cinematic memoir, a coming-of-ager about a clever, fearless girl growing up during the period leading to the Shah’s downfall, and then the repressive Islamic regime. For a time Marjane outsmarts the “social guardians,” discovering punk and Iron Maiden, but her boldness causes her parents to fear for her safety. At age 14, she’s sent to school in Vienna, where she finds herself tarred with the fundamentalism she fled her country to escape. Marjane returns home to her close-knit family —and the tyranny of Iran — but leaves after a few years to settle in France. How to explain to date the success of this black-and-white toon? Its characters grab you, for one, starting with Marjane herself (Mastroianni), an elfin, irreverent figure who converses with God and Marx, and struggles to make sense of a repressive regime; then later in Vienna, wrestles with adolescent angst compounded by her exile status. Add to the cast her uncle Anoush, her mentor and a political prisoner; and her outrageous grandma (voiced by Danielle Darrieux), offering unconventional views on life and love (a character, Satrapi told me, she had to tone down from the reality). And like a good novel, the film is packed with concrete details that render the texture of a life. Satrapi has devised a pungent mix of the personal and the political, engaging viewer sympathy for her protagonist, while opening a window on a complex culture. 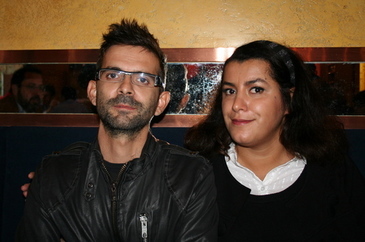 indieWIRE caught up with Satrapi and Vincent Paronnaud during a recent press junket in New York. You’re immediately struck by how Satrapi in person resembles the Marjane of the graphic novel and film: same dark flashing eyes, mole on the nose, mischievous curl to her lip. Paronnaud speaks little English — but Satrapi, though suffering from a killer cold, talked with gusto about the genesis and creation of “Persepolis,” vehemently insisting on its “non-political” stance, until her voice literally gave out. indieWIRE: Vincent, how did you and Marjane get together in the first place? Vincent Paronnaud: She called me one day to share her design studio [in Paris]. She’s very outgoing, obviously; I’m reserved. She liked my cartoons — I’d been publishing underground comic books. And voila, we became friends. Marjane Satrapi: When I first saw Vincent’s drawings at a friend’s house, I thought, ‘You’d have to cut this guy’s fingers off to stop him from drawing!’ There’s something totally off the wall about his work, yet it also has dignity and decency. iW: How did you arrive at the film’s look? VP: It was something of a compromise. We kept the characters from the book. Then we looked elsewhere for the production design. Marjane is very fond of Murnau and German expressionism, so we drew our inspiration from that. And “The Night of the Hunter” was an inspiration, too. MS: Yes, there’s this scene in “The Night of the Hunter” when the kids are downstairs, and you have the feeling that they’re both in a room and at the same time it looks remote. And you wonder, How can you give the effect of both “inside” and “outside” at the same time. And you realize, by watching it many times, that around the scene there’s this black edging. These are the kinds of solutions we looked for in designing our film. It makes for a bigger story, gives it the look of a fairy tale. iW: Could you describe your process of collaboration? MS: I wrote the plot and Vincent and I wrote and discussed the shooting of the script. Vincent then took care of the production design, the actual shooting, and what was going on within each scene. It’s very difficult, though, to draw a line between who did what. Because Vincent would say something, and I would add something, and at the end you have this film, yet no clear idea of who did what. iW: What was the role of Marc Jousset, the third collaborator? MS: Marc was more of a technical person, the head animator. He knew which things were possible, and which were not. He put the scenes together and made it move. Marc oversaw a team of thirty animators. But in animation you have to be careful that the model doesn’t change. Because some of the team, for instance, had made Disney movies. iW: How did you translate the drawn figures into animation? MS: You draw the character from all angles — side, profile, back, etc. so the animator has this character in all the ways it looks like. Then he refers to that and starts moving it. iW: Why did you go with animation for this story rather than live-action? MS: Three reasons: With live-action I think we’d have lost the universal appeal of the story. With live-action, it would have turned into a story of ‘the Other’ — people living in a distant land who don’t look like us. It might have been exotic, but also a “Third-World” story. The novels have done so well because the drawings are abstract, black-and-white. This adds to the universality of the story. “Persepolis” also has dreamlike moments, and the drawings help maintain cohesion and consistency. Then, too, drawing is the first language of the human being before writing. It’s a transcription of how the human being sees reality, not reality itself. Another reason was we had so many different narratives in the movie, ranging from the surreal images of God and Marx, to scenes of war, to scenes of the family. If you’re not Fellini you might make something very vulgar. Animation made it possible to maintain unity with all these different narratives. And, third reason, the most natural thing for us is drawing. The characters are hand drawn. We’re not technical people. We don’t know how to type. iW: You mean, you’re not computer literate? VP: No, we wrote the script in pencil because it can be erased. MS: We’re like retards when it comes to the technical. I almost don’t know how to write an email. iW: Why did you choose Chiara Mastroianni for “your” voice? MS: She had heard about the film through her mother [Catherine Deneuve], and called me to do a voice test, after which we immediately connected. I loved her voice, her talent, her generosity. We rehearsed for two months…She’s a workaholic and perfectionist, like Vincent and myself. iW: Will American viewers “get” the film’s politics — at times a harsh critique of the West? MS: People “get” this film on many different levels. Kids identify with Marjane. For adolescents, it’s a movie about adolescents. For older people it’s a movie about the grandmother. Somebody like you goes beyond somebody who doesn’t have any knowledge. But everyone can connect with the human side of the film. If viewers feel the characters are just human beings like us and “get” it at that level, we have reached our goal. But I really don’t see the film as political. First and foremost it’s about my love for my family. iW: Yeah, but in certain ways it seems to me a very political movie. It advocates tolerance and pluralism — not a neutral message in many parts of the world. MS: Yes, but for me what is called political is something that gives simple answers to complicated questions. Like a leaflet, like a manifesto. This is good and this is bad… The film is not political in the sense that we don’t have answers — we’re just putting the situation out there and asking people to think about it themselves. MS: Yes, but you have guys here, you know, who go in front of hospitals to stop abortion. For me George Bush is just as scary, if not more. Because he doesn’t look like a scary guy, because he’s shaved and he has a tie on. But he’s a real fanatic — a fanatic by definition is the one who says, if you are not with me, you are against me, and that’s exactly the position he takes. The mullahs in my country, it’s obvious. But a guy who says I am the president of the biggest secular democracy in the world and asks people to read the Bible and make crusades and says he’s God’s best friend — this guy is even more scary because you don’t see it at the beginning. iW: Still, he doesn’t have the same day-to-day impact on people’s lives like in your film the police stop people from having a party. MS: Yes, but Bush can go and kill thousands of Iraqis every day. By making people believe they are the enemy, and not human beings any more. If evil has an address, a nationality, you can exterminate all of them. This is fascism. But evil is international and the fanatic is international and universal. There is no difference between a Muslim fanatic, a Christian fanatic, even a secular fanatic.